This tough electro welded mesh is hot dip galvanized aviary mesh. These mesh panels can be used as aviary wire mesh. This aviary wire is guaranteed for five years. This tough electro welded mesh is hot dip galvanized aviary mesh PVC coated in white. These mesh panels can be used as aviary wire mesh. This aviary wire is guaranteed for five years. This tough electro welded mesh is hot dip galvanized aviary mesh PVC coated in green. 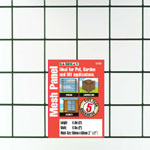 These mesh panels can be used as aviary wire mesh. This aviary wire is guaranteed for five years. This tough electro welded mesh is hot dip galvanized aviary mesh roll. These galvanised wire rolls can be used as aviary wire mesh. This aviary wire is guaranteed for five years.